Costumes and attributes Greek Roman deities. 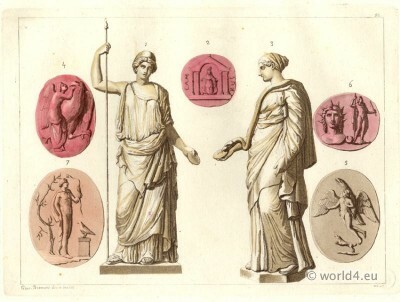 Aggiunte all’opera Il costume antico e moderno di tutti i popoli, cogli analoghi disegni, published by Ferrario, Giulio, 1767-1847. This entry was posted in 1799, 18th Century, Ancient, Ancient Greece, Hairstyle, Roman and tagged Ancient Greek Costumes on 7/8/13 by world4.